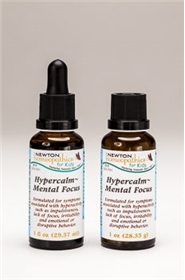 Formulated for symptoms associated with hyperactivity such as impulsiveness, lack of focus, irritability and emotional or disruptive behavior. Directions: Children, ages 0 to 11, give 3 drops or pellets orally (ages 12 and up, give 6 drops or pellets) one to four times daily or as directed by a healthcare professional. Under age 2, crush or dissolve pellets in purified water. Sensitive persons begin with 1 drop or pellet and gradually increase to full dose. Active Ingredients: Adrenalinum 15x, Tarentula cubensis 15x, Aconitum napellus 10x, Argentum nitricum 10x, Arsenicum album 10x, Baptisia tinctoria 10x, Chamomilla 10x, Coffea cruda 10x, Cypripedium pubescens 10x, Digitalis purpurea 10x, Gelsemium sempervirens 10x, Humulus lupulus 10x, Hyoscyamus niger 10x, Ignatia amara 10x, Impatiens glandulifera flos 10x, Iodium 10x, Lachesis mutus 10x, Lycopodium clavatum 10x, Natrum muriaticum 10x, Nux vomica 10x, Scutellaria lateriflora 10x, Staphysagria 10x, Stramonium 10x, Theridion 10x, Veratrum viride 10x, Chamomilla 3x, Echinacea 3x, Hypericum perforatum 3x, Passiflora incarnata 3x. Aconitum napellus: Panic with restlessness; Anticipation; Tendency to be startled. Adrenalinum: Nervous and despondent; Lack of interest in anything; Aversion to mental work, cannot concentrate thoughts. Argentum nitricum: Nervous impulsive and hurried, yet timid and anxious; Anticipation, apprehension and fear. Arsenicum album: Children are capricious, want to be carried; Upset about disorder, dirt, germs; Changes place continually. Baptisia tinctoria: Wants to be on the move; Vaccination effects; Wild, wandering feelings. Chamomilla: Children want to be carried and held; Especially of frequent employment in diseases of children, where peevishness, restlessness, and colic give the needful indications; For highly emotional, temperamental and oversensitive persons. Coffea cruda: Hyperactivity of mind and body; Irritable and wakeful. Cypripedium pubescens: Sleeplessness and agitation; Irascibility (easily angered) and throws emotional fits. Digitalis purpurea: Dullness of senses; Wants to be alone. Echinacea: Confused feeling of the brain; Cannot exert mind; Does not wish to think or study. Gelsemium sempervirens: Incapacity to think or fix the attention; Children fear falling, grab nurse or crib. Humulus lupulus: Confusion; Mental functions remain indolent (sluggish) for several months. Hyoscyamus niger: Child sobs and cries without waking; Suited to nervous, irritable, exciteable people. Hypericum perforatum: Irritable and depressed; Weakness of memory. Ignatia amara: Rapid change of mental condition; Emotional state of frustration; Oversensitiveness and nervous. Impatiens glandulifera, flos: Mind is tense, wound-up and urgency to work and move fast. Iodium: Excited and restless; Sudden impulse to run and do violence. Lachesis mutus: Frequently jumps from one subject to another; Weak memory. Lycopodium clavatum: Irritable, angry, sad and anxious upon waking; Weak memory, confused thoughts. Natrum muriaticum: Mental behavior and physical symptoms are hopeless or awkward in nature; Scattered thoughts. Nux vomica: Desire for stimulants; Overactive mind; Always seems to be out of tune. Passiflora incarnata: Insomnia of children; Sleeplessness in screaming children; Neuroses of children. Scutellaria lateriflora: Confusion of the mind; Inability to study or fix the attention on one's work; Nervous irritations and spasms of children during dentition. Staphysagria: Want of self-control; Restless, finds pleasure in nothing. Stramonium: Force of action on the brain, producing marked and persistent disorder of the mental faculty. Tarentula cubensis: Nervous; Restlesness; Anxiety. Theridion: Fruitless activity; Wants self control; Restless, finds pleasure in nothing. Veratrum album: Loquacity (excessiviely talkative) with exaltation of ideas; Children tremble as if frightened and on the verge of spasm. My daughter is ADHD. Im fighting with her school, to avoid medication. If this product works, i will be very happy. I have only used one prescription and the affect were terrible. No appetite, crying all the time. This is my first day trying this product on my daughter if it work yow will hear from me.